As late as 1980, the public face of the American empire – those individuals who appeared to be influential at the highest levels – was lily-white (with the exception of Supreme Court Justice Thurgood Marshall and Senators Edward Brooke, Muriel Humphrey, Margaret Chase Smith and Hattie Caraway), and exclusively male. Since then, due to pressure from progressives, feminists and minorities, several blacks, Latinos and women have been admitted into the most rarified clubs of American leadership. U. S. Senator: Carol Mosely Brown, Barbara Mikulski, Lisa Murkowski, Jeanne Shaheen, Dianne Feinstein, Mazie Hirono, Tammy Duckworth, Joni Ernst, Susan Collins, Elizabeth Warren, Debbie Stabenow, Amy Klobuchar, Claire McCaskill, Barbara Boxer, Catherine Cortez Masto, Jocelyn Burdick, Nancy Kassebaum, Kay Bailey Hutchison, Jean Carnahan, Elizabeth Dole, Olympia Snowe, Deb Fischer, Kelly Ayotte, Roland Burris, Tim Scott, William Cowan, Corey Booker, Kamala Harris, Maggie Hassan, Kirsten Gillibrand, Heidi Heitkamp, Patty Murray, Maria Kantwell, Shelley Capito and Tammy Baldwin. 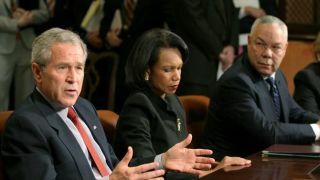 National Security Advisor: Colin Powell, Condoleezza Rice and Susan Rice. Secretary of State: Madeline Albright, Colin Powell, Condoleezza Rice and Hillary Clinton. Ambassador to the U.N.: Rice, Andrew Young, Donald McHenry, Jeanne Kirkpatrick, Edward Perkins, Anne Patterson, Zalmay Khalilzad, Rosemary DiCarlo, Samantha Power, Michelle Sison and Nikki Haley. The U.S. loves to show off our diversity at the U.N.
Supreme Court: Clarence Thomas, Sandra Day O’Connor, Ruth Ginsburg, Sonia Sotomayor and Elena Kagan. Except for the presence of some embarrassingly silly clowns (Sarah Palin, Betsey De Voss, Michelle Bachman, Herman Cain, Ben Carson, etc), this is a welcome series of events and undoubtedly offers a vision of possibility to millions of minority children. It’s the classic American story: persons of merit rise to the top, carrying with them the aspirations of countless others. In terms of the myth of American Innocence, however, these were changes that were necessary to shore up cracks in our national narrative. For two centuries, Americans and would-be Americans had been subjected to a series of bizarre contradictions, one of the most crazy-making of which had been that stories of inclusion and opportunity had co-existed with the realities of racial and gender exclusion. After the cataclysm of the 1960’s, when every aspect of “Americanism” had been called into question, the elite classes grudgingly accepted that these cracks in the myth had to been shored up with the symbolic inclusion of a few reliable – and safely vetted – minorities. Even then, it took another ten years before the right-winger Jeanne Kirkpatrick was named to be U.N. ambassador and yet another twenty years before Colin Powell became Secretary of State (after having proved his loyalty by denying the existence of the My Lai massacre in Viet Nam). Their presence has been nothing more than a merely symbolic indication of progress in the long struggle for inclusion in America. A generation of Americans has grown up innocently assuming that minorities have always had leadership roles – in an empire that has caused massive human suffering. If a woman or a person of color is directing foreign policy, goes this argument, then perhaps we aren’t as evil as others say we are. Perhaps we really are an exceptional nation. There are, however, almost no persons of color in leadership roles in the area where the real decisions are made – finance. In reality, these people have been paraded before us in a time when (with the exception of gay people), the actual process of Othering of racial and religious minorities, as well as the parallel sense of victimization among whites, have increased dramatically. After two years of mounting evidence, we can no longer deny that Barack Obama has quite consistently carried on Bush and Clinton administration policies that have killed millions of people in the Third World and destroyed the American Dream for all but the top ten percent of the population. Now it should be clear to all he has had one primary function: to serve the myth of innocence by embodying the superficial face of inclusion of the Other. This entry was posted in Uncategorized and tagged Barry's Blog # 17: The Face of the Empire. Bookmark the permalink.